For way too long now I’ve been carrying around my electric guitar in an old acoustic Rock-Sak, so you can imagine my delight when receiving a brand-new Gator Electric guitar gig bag as a birthday gift this year. 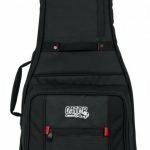 The Gator Pro Go G-PG electric guitar gig bag is a durable and high quality solution suitable for the most common shapes of electric guitar. Often overlooked by beginners, the purchase of a high quality gig bag is a great investment and while it may not be as exciting as a new guitar or effects pedal purchase, making a good decision here will serve you and your guitar for many years to come. These days at the budget end (and even some mid to high-end guitars), a case doesn’t always come as standard and if you’re going to be out and about with your guitar regularly, its a great option. If your happy with the length of your arms, avoid those weighty coffin style hard cases and invest in a high quality gig bag. 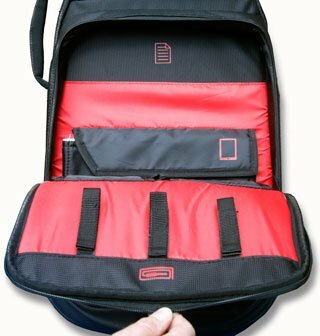 You’ll be rewarded with a lighter and easier way to transport your instrument in a case made from toughened material with shoulder straps for ease of use. You should also avoid those ‘dust cover’ style sleeves that may come with new guitars too, they are wafer thin and protection wise offer close to nothing. With first impressions its obvious that a lot of effort has been made with the Pro Go to produce a high quality and durable solution for transporting your guitar. Unlike some gig bags which suffer from neck-flop (a technical term I just made up, i’m referring to the neck part folding when empty), the Pro Go keeps its rigidity which makes you feel confident that its thickness and strength will offer great protection. It also makes packing up snappy too. Gators tag-line for the Pro Go reads: ‘the toughest gig bag on the market’ and that’s not such a hard statement to believe – it definitely looks and feels sturdy, the ultra-thick padded sidewalls offer great protection while the internal micro-fibre fleece lined interior offers a luxurious feel and look. Inside you’ll find a removable neck cradle and extra padding at the bottom of the case which feature the same micro-fibre fleece material with the ability unzip and wash if needed. The tightly woven nylon outer material is strong and durable and the shoulder straps offer thick padding and a wide area to spread the load ensuring maximum comfort. 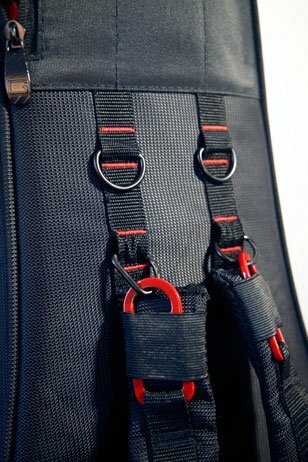 Chunky red carabiners are used to attach the adjustable shoulder straps and the zips are reassuringly weighty. At 6.5 lbs, it may be slightly heavier than some of its competitors however the inclusion of a large accessory storage pocket reduces the chance that you’ll need to carry a backpack for extras. This well thought out storage area includes a sheet music pocket, effect pedal holsters, cable storage using velcro cable ties and even a fleece-lined tablet pocket. Although the outer shell seems like it would stand up well to wet weather, there is a concealed ‘pac-a-mac’ style rain cover included which conveniently stows away in a pocket on the back of the head stock area. A nice touch giving you reassurance in bad weather (particularly useful here in the U.K!). The cover grasps the case with its elasticated seams and there is a cut out to allow side handle access. Both the main pocket and neck pocket interiors feature the same bright red colour that appears on the handle stitching and tabs. This minimal colour scheme of black with red featured stitching on the handles and shoulder straps give the case a classy and stylish look while the Gator Cases logo is embroidered on the front accessory pocket. The internal neck support cradle has a decent height to it and should be suitable enough to support guitars with angled head stocks however if in doubt there’s a useful ‘case advisor‘ tool on the Gator Cases website to confirm. The cradle is is also adjustable with a velcro base allowing you to place slightly higher or lower if needed. At the base, the interior uses Gators ‘body block internal shock absorber’ which is basically a thick chunk of foam covered in the micro-fibre fleece material which attaches with a velcro base to run along the bottom contour offering around 12cm of padding (including the case wall) to the bottom of your guitars body – a sensible area to reinforce as its most likely to undergo impact. The same toughened nylon material features on the interior at the guitars body and head stock areas to avoid the softer fleece material being damaged with loose string ends and bridge parts. 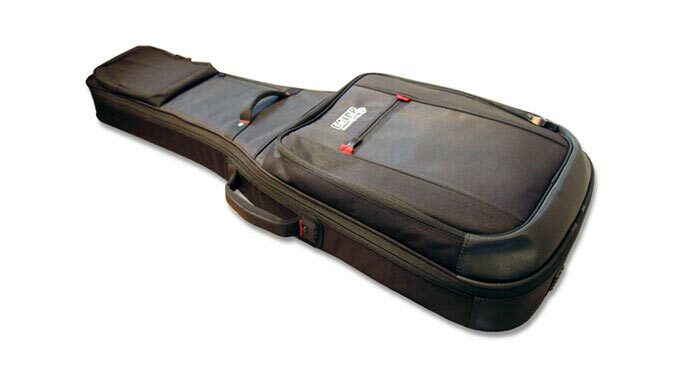 Gator gives the name ‘Pro Go’ to a whole range of cases including Pro Go’s for acoustic, classical, bass, combination cases and even Ukelele cases all offering the same high quality protection as shown here. There’s even a model for Gibson 335 style and Flying V guitars too. I’ve had my Pro Go for over three months now and its definitely made my life easier. For me, the three keys to a successful gig bag are comfort, durability and practicality and the Pro Go wins in all these areas. Navigating public transport can be a pain for guitarists however I never felt like the case was in the way and once the shoulder straps were adjusted its very comfortable on your back. Although it may be slightly heavier than some gig bags its not overly heavy and still manageable. I’m a big fan of the large grab handle on the front which makes manoeuvring through small spaces easier as well as loading and unloading in the car boot and luggage holds. The storage allows me to carry all my books and accessories in one place, I no longer need an additional small rucksack which makes life easier. Gator even thought of a handy fold away rain cover that stealthily packs away in its own pocket on the reverse of the head stock area. I’m currently using my Pro Go for a strat style guitar with a straight head stock and am glad to report that the tuning pegs haven’t suffered from being knocked out of tune as sometimes happens in flimsier cases – Gators neck support suspends the head away from the side walls avoiding this issue. In my opinion the Gator Pro Go delivers the goods with a great range of features in a sleek modern package. The case may be half the price of your whole guitar if you have a budget end instrument but no matter how expensive your guitar is, it won’t be much use to you in poor shape. This case is tough enough to endure the many battles you will face as a guitarist from accidental drops and knocks to being thrown about at gigs plus surviving torrential downpours. If your in the market for a tough high quality gig bag you’ll be struggling to find anything better at this price point. Mono M80 – Mono’s standard single electric case features a waterproof outer shell and clip on storage as an additional purchase. Slightly less padding internally for the guitar base compared to the Gator Pro Go. 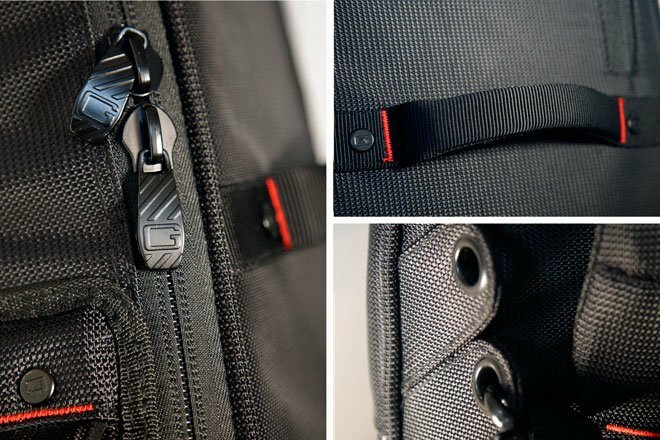 Mono M80 Vertigo – This flagship case by Mono features a waterproof outer shell and large rubber sole, The Vertigo lacks the front pocket storage of the Pro Go, although space can be added as an additional purchase with the ‘Guitar tick modular tool case‘ which attaches to the neck area via D-ring attachments. Thanks for reading and if you enjoyed this review or have any comments or questions about the Gator Pro Go Guitar case please join in below. A very thorough review there. I know a guitar teacher and enthusiast who I’ll share this with. Thank you! Hi Lace, thanks for checking out this review and sharing its much appreciated! This is a very thorough review and is very convincing that this is the best guitar case to buy. Hey Radha, glad you enjoyed the review, yes the Pro Go has a great price to quality ratio and is one of the best in my opinion, its not let me down yet! This is a great guitar case! My dad plays the guitar. He can always use a good new case and Christmas is coming up! So I am glad I found your website. He is the guy that has everything, but his case he has now it really been around a very long time. Time for a new one. This is a great idea and gift for him! I have my guitar sitting in its case and has been for over a year now. If nothing else you have reminded me to drag it out and get strumming again! haha! This looks like a great gig bag. Hey Kevin, you should definitely pick up your guitar again, theres lots of benefits to playing! Glad you enjoyed the review what guitar do you have? I own this product personally and it is great. Its been through a lot and still is holding up just as it did when I first purchased it. Great Review, used to play but gave it up as I got older and into a lot of other things. I had left an acoustic guitar in its case in the closet and when I moved, the back of the guitar had cracked. This case would have been ideal. Thanks Steven! glad you enjoyed reading it!